Moisture Room Control Panel - Gilson Co.
HM-630 Moisture Room Control Panel is a wall-mounted system that automatically blends hot and cold water supplies to keep your concrete specimen curing environment at precisely 73.4 ± 3°F (23 ± 1.7°C) and 100% humidity. It is a stand-alone device used specifically with HMA-298 Atomizing Spray Heads, and does not integrate with other foggers, misting devices, compressed air, or HVAC units. A dedicated hot water tank is recommended to assure constant temperatures. The easy-to-read digital controller display allows simple input of temperature set points for automated control. A manual bypass system assures continuous maintenance of specified temperature and humidity levels if power is interrupted. The panel has space to add a temperature recorder or data logger, available separately. Quick-connect water line fittings are fast and easy to install. 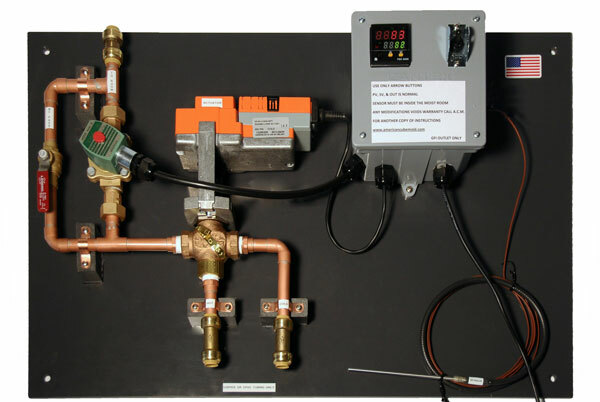 Inquire for custom design of a closed-loop layout with atomizing spray head pattern for your cure room based on room dimensions, and water temperatures and pressures. One-pass water chillers also available as required. Note: The HM-630 is only offered in 115V/60hz and the use of a transformer is not recommended.